LR Wholesale faced a problem: Electric costs were already hitting the business hard, and looming rate increases were troubling. The owner of the business had a vision for investing in their own power. The owner found Renu Energy Solutions and consulted with their experienced staff about this ambitious dream to go solar. Renu then drew up a plan and began the process of bringing the project to fruition, in close dialog with the customer. 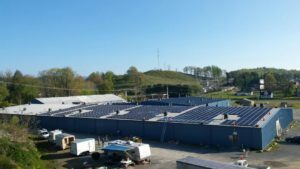 The business owner learned that a 295 kW solar system would be suitable for offsetting utility bills, and there was going to be ample roof space available for an installation of this size. Federal incentives including a tax credit helped the project generate savings right away. At that point the case was compelling, and LR Wholesale committed to go solar. LR Wholesale’s solar system saved an estimated $23,800 in the first year of operation and allowed them to cut their grid energy usage and thereby reduce air pollution equivalent to removing 45 cars from the road for a year. Solar is projected to save LR Wholesale hundreds of thousands of dollars over the 40-year lifetime of the system, enhancing their financials. For a large energy user, solar can be an especially wise investment: the customer dramatically cut use of grid power, saving demand charges and even relieving grid congestion.